Do I love a shrimp avocado salad or what? I can’t tell you how much I love them. What I can tell you is how to make one. It is so simple, filling, and delightful. It is also stunning. I will admit I have one at least once a week and it has become a family favorite. This easy shrimp recipe is a family favorite and my go to lunch. 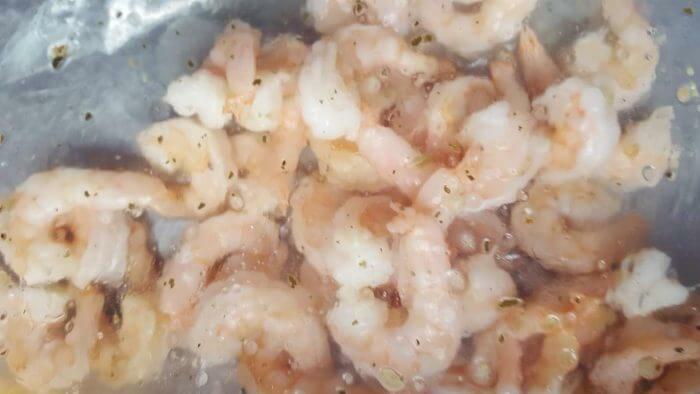 This can be done the night before and it is my easy shrimp recipe. You will want to take your frozen shrimp out of your freezer to thaw. Then place it in a freezer bag with your marinade or dressing and put it in your refrigerator. It will be ready the next day for your salad or for the next couple of days. I made a super one right here, cilantro lime dressing. You let it sit overnight for your salad. I know you may have forgotten to do this and it is okay. You can simply run your frozen shrimp under cool water. Then you place your shrimp in a bowl with the marinade/ dressing while you making the rest of your salad. Once your shrimp has begun the marinade process or after you have pulled the shrimp out of the refrigerator begin to plate the washed salad. I usually slice my cucumbers in half. Then the very last thing I do is cut the avocado in half. I remove the seed but I leave on the skin. It will help create a bowl for my easy shrimp recipe. I place the shrimp into the avocado. I place the avocado on the salad. I take the remaining marinade or dressing and put it on top. Then I serve the salad. 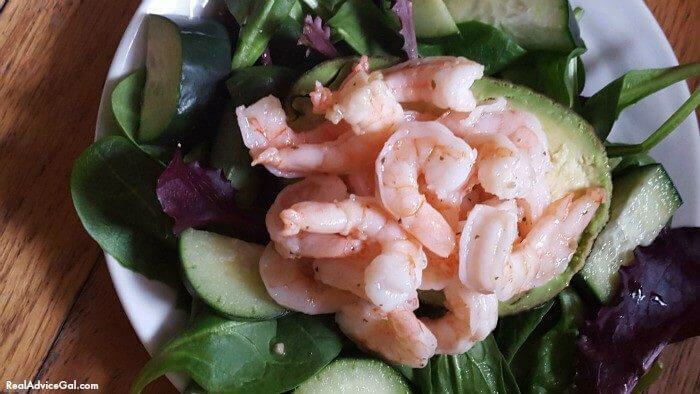 It is not only pretty, but also healthy I just love this shrimp avocado salad. Let me know if you enjoy it as much as we do. 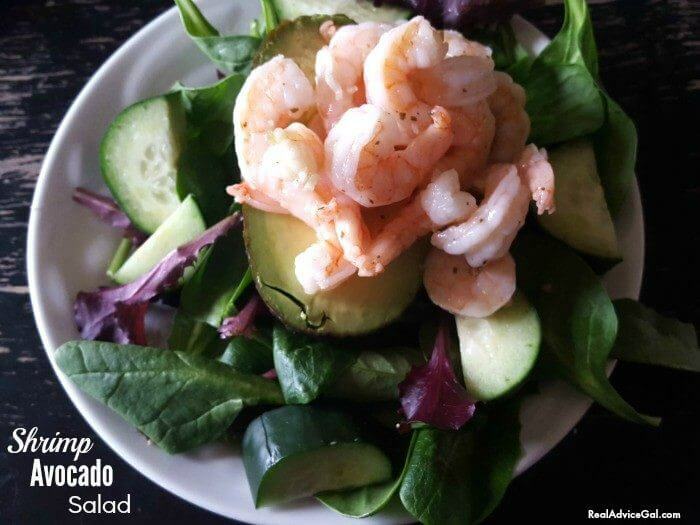 A super easy and delicious Shrimp Avocado Salad Recipe, perfect for a quick lunch. Then place it in a freezer bag with your marinade or dressing and put it in your refrigerator. It will be ready the next day for your salad or for the next couple of days. You let it sit overnight for your salad. Then you place your shrimp in a bowl with the marinade/ dressing while you making the rest of your salad. Once your shrimp has begun the marinade process or after you have pulled the shrimp out of the refrigerator begin to plate the washed salad. I usually slice my cucumbers in half. Then cut the avocado in half. I remove the seed but I leave on the skin. It will help create a bowl for my easy shrimp recipe. Place the shrimp into the avocado. 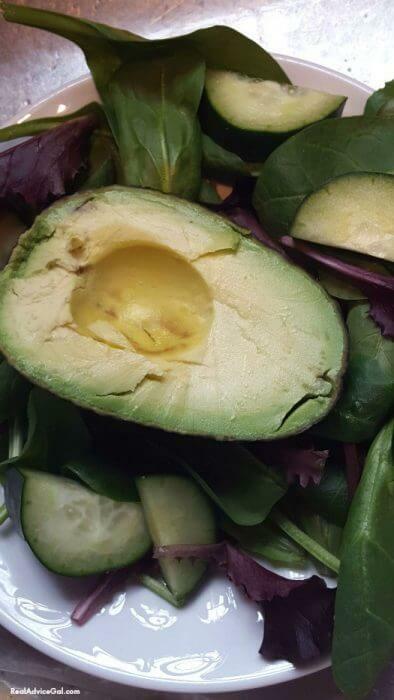 Place the avocado on the salad. Take the remaining marinade or dressing and put it on top.